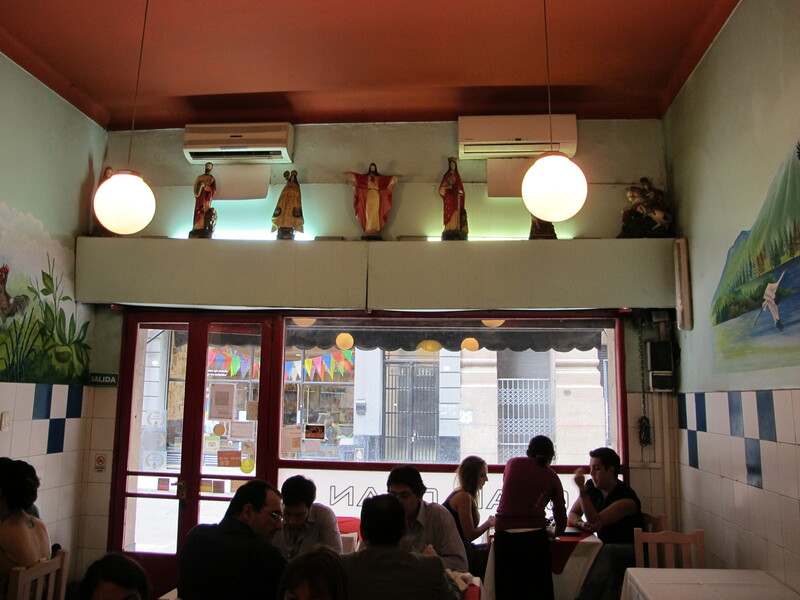 During my ten day October 2013 vacation in Buenos Aires, searching for alternatives to the fantastic “parillas” around town (yes, they serve the tastiest meat dishes), I was delighted to read raving reviews on Chan Chan restaurant and even more enthused to try it when I read that it was Peruvian food. Chan Chan in Peru is a UNESCO World heritage site and apparently was the largets mud city in pre-Columbus America, once upon a time capital of the Chimú kingdom, a pre-Inca culture. I guess this tiny, cozy family-run restaurant’s name refers to the once-upon a time grand empire. Even though I would not dare explain the ambiance as grandiose, at least not in my books, the food is magnificent. 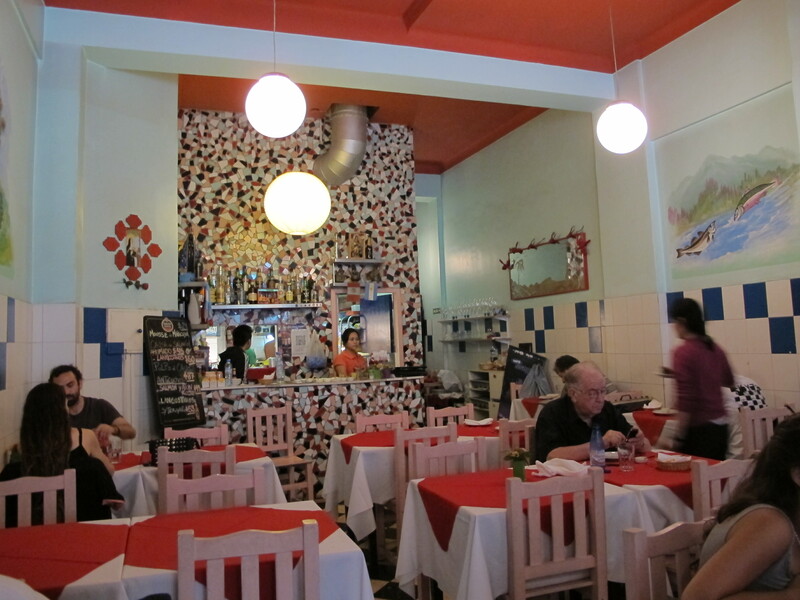 The colourful but clumsy mosaics, the relics peering from all corners, even from amongst wine bottles, the rudimentary scenery paintings on the walls, the pink chairs, the white and red table cloths all add a certain coziness and charm to this easy-going restaurant with fast traffic- tables filling up as soon as they empty. The ambiance is not fancy, feeling more like a local eatery with a constant buzz. Just like a book is not to be judged by its cover, the chef treats customers to a real feast that is light on the pocket without skimping on the flavour. 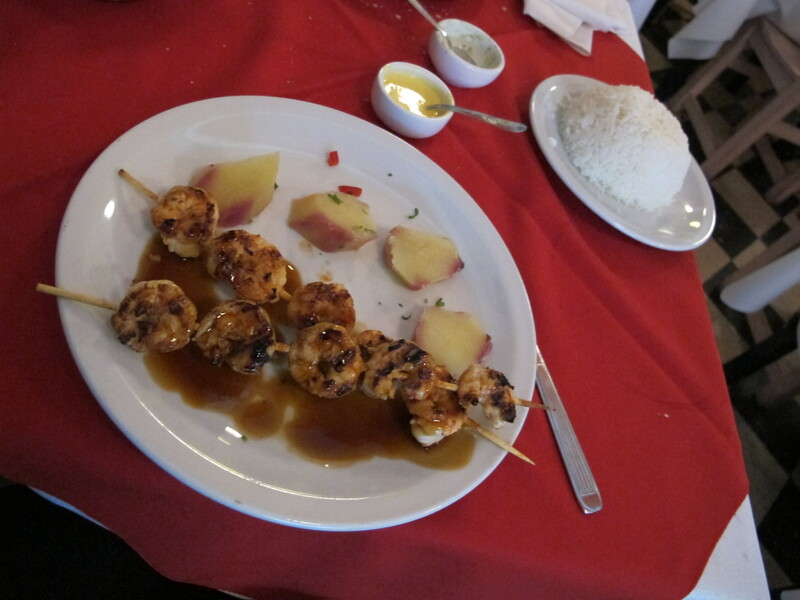 My lunch order was shrimp on skewers, marinated with teriyaki sauce, rice and the local Peruvian soft drink – chichi morada. 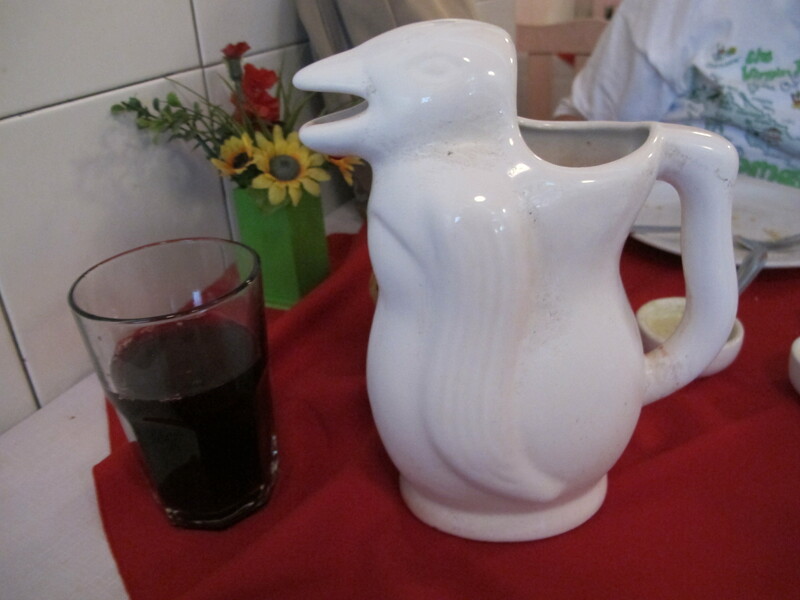 Chichi morada, served in a white bird-themed pitcher, is apparently prepared from boiled purple maize, powdered cloves, sugar and cinnamon. The taste is reminiscent of old fashioned clove flavored candy. The delicate waitress with the most radiant smile serving me also brought me some bread with two very flavourful dips. In fact I was almost full feasting on bread and sauce until my main order came in a short while. My lunch experience definitely lived up to the reputation. The food was was delicious, fresh, a good-sized portion, great value coupled with wonderful service – warm, quick, time to explain the menu and all smiles. I had trouble finishing my dish which was a healthy portion, hence did not have room for dessert but I would expect the Suspiro de Limena to be excellent. I was fortunate enough to catch the final lunch serving hours as I understand that the restaurant is closed between 15:00 and 20:00 when it re-opens for dinner. It is said that it gets fairly crowded at dinner time and it is best to get there early. 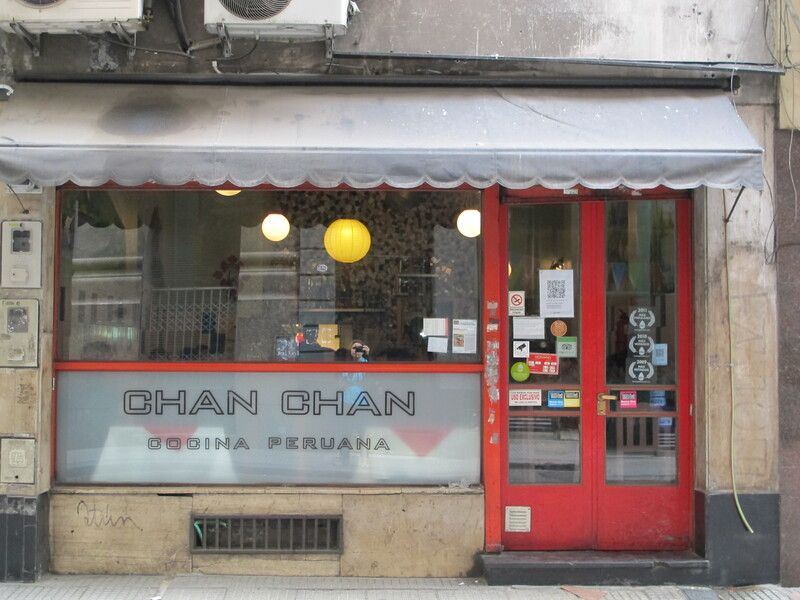 Although the meat dishes in Argentina are unbeatably delicious, if you need a break from a parilla, Chan Chan is definitely a find. It may never win any awards on décor, but the food is delicious and the atmosphere has a positive vibe. 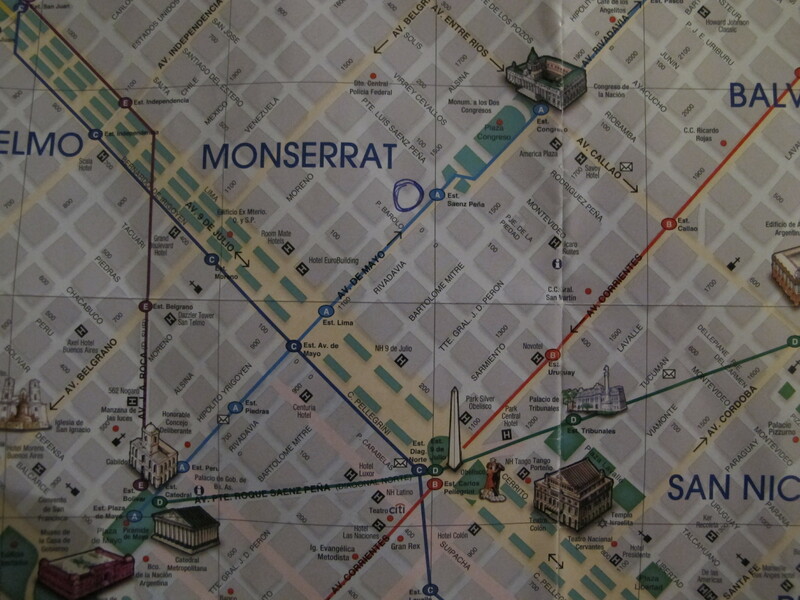 If I were a local, I could easily become a fan. In fact now that my Buenos Aires visit is over and I am back in Istanbul, I wish I had made a second trip to try another scrumptious dish at this gem of a restaurant. hoping to provide one thing back and aid others such as you helped me. 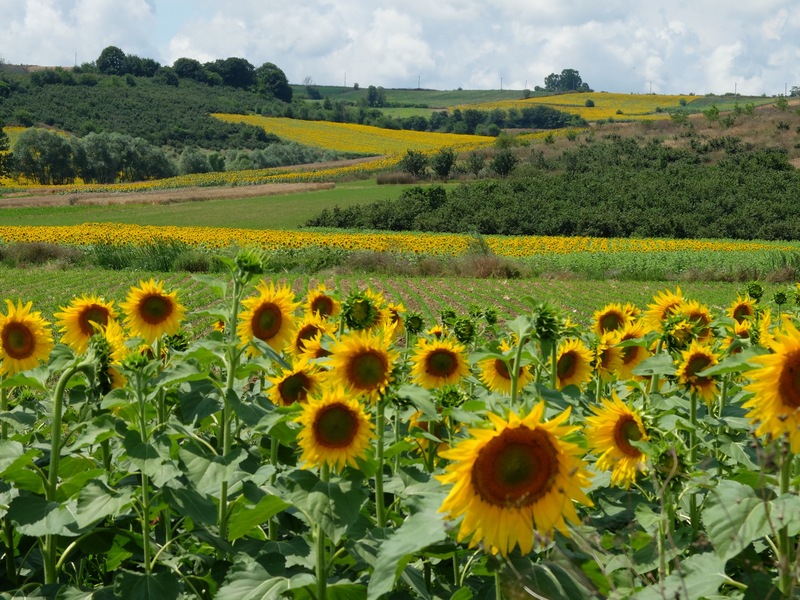 Hi there to every one, since I am truly keen of reading this weblog’s post to be updated daily.